In 1884, the town council of Calais commissioned Auguste Rodin to create a monument commemorating the end of the terrible siege of 1346-47, when the conquering English agreed to accept the town’s surrender without punishment if six prominent citizens (burghers) would offer themselves as permanent hostages. 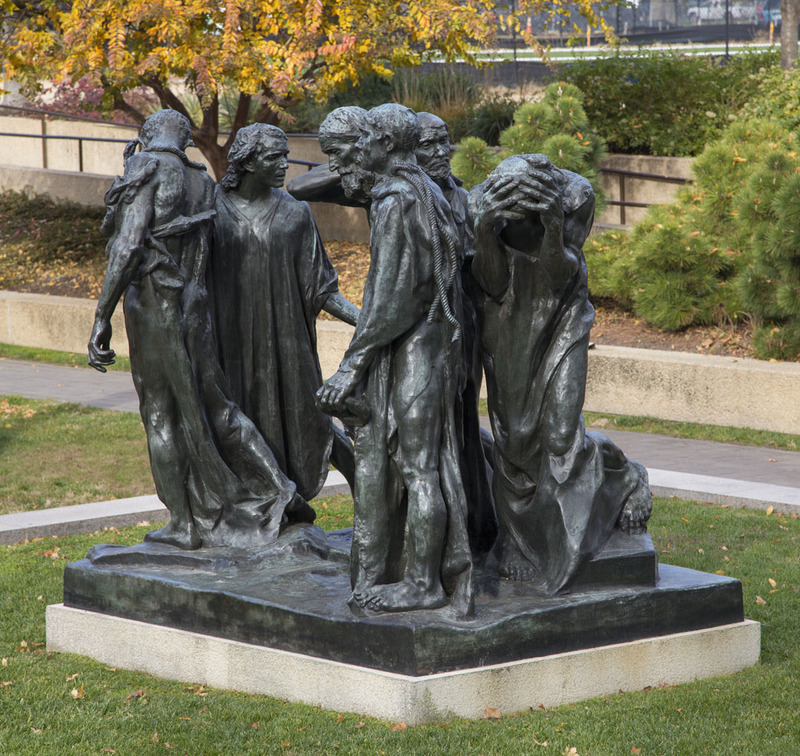 Rodin portrayed the burghers with necks encircled by ropes, their bodies covered only by rough robes, as they walk barefoot to deliver the keys of the town. Unlike traditional monuments, which showed heroes striding forward proudly, Rodin depicted the mens’ profound anguish at leaving their homes and families. He distorted the figures to express emotional trauma: the enlarged hands and feet emphasize their melancholy gestures and faltering steps, the tautened muscles convey a sense of physical stress, and the deeply sunken eyes and furrowed brows express heart-rending torment. The novel idea that heroic deeds are performed at great sacrifice by average people infuriated the Calais authorities, who reluctantly accepted the monument in 1895 but refused to place it in front of the town hall until 1925. Despite this late acceptance, Rodin’s vision set a precedent for later commemorations of the efforts of ordinary soldiers, such as Felix de Weldon’s epic “Iwo Jima Memorial” (1954) and Maya Lin’s contemplative “Vietnam Veterans Memorial” (1982) in Washington, D.C. Text adapted from “Hirshhorn Museum and Sculpture Garden: 150 Works of Art” (1996), entry by Valerie J. Fletcher, and from “A Garden for Art” (1998), by Valerie Fletcher.